1. Preheat the oven to 160˚C, gas mark 3; line 2 large flat baking trays with parchment. With the paddle attachment on a freestanding mixer (or using electric beaters), cream together the butter, sugars, salt and spices until soft and creamy. Mix in the white chocolate. Add the flour in 2 batches on a slow speed until it forms a firm dough. 2. Tip out onto a lightly floured work surface; divide the dough in half. Knead each half well into a smooth ball. Halve each again so you have 4 balls of dough. Roll out each piece to 0.5cm thickness and use a palette knife to cut out different-sized equilateral triangles from each batch. Start with 2 large triangles from the first batch and finish with 8-10 small triangles and one star from the last one. You want a range of sizes, from 4cm-23cm (they don’t have to be exact). 4. To assemble, melt 300g white chocolate in a heatproof bowl over a pan of just-boiled, but not boiling, water off the heat (about 15 minutes). Take the bowl off the pan; stir well. Add the remaining 100g white chocolate; stir until melted. Tip the coconut onto a plate. Brush the edges of each triangle with melted chocolate and dip into the coconut. Set aside on parchment for 10 minutes until set. 5. 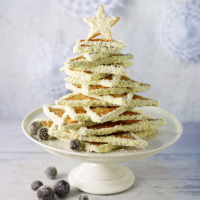 Using the remaining chocolate as glue, build your tree by sticking the biscuits together on a cake stand, starting with the biggest. Put them at varying angles to create tree branches; finish with the star on top. Allow to set for at least 1 hour. The assembled tree is best eaten within 24 hours. This recipe was first published in Thu Nov 29 13:04:26 GMT 2018.